Sardinia has an unforgettable coastline, but the interior of the island is equally as beautiful. A fun way to explore it is aboard the Trenino Verde (Little Green Train), a vintage steam locomotive that puffs its way through forests, over bridges and through tunnels into some of the island's most scenic mountain areas. The narrow-gauge train tracks were laid in 1888 to serve the more isolated areas of Sardinia, and the picturesque restored train and locomotive is just as old. The train runs on scheduled routes, connecting Nuoro and Bosa, Sassari and Alghero, Sassari and Palau, and Cagliari and Arbatax. Most popular is the Cagliari to Arbatax route, which departs each morning in summer at about 6:45am. The train is small and tickets are limited so it is best to book in advance. 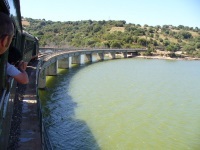 The train sometimes stops at scenic spots so that passengers can stretch their legs and take photographs. It is best to face forwards - the direction that the train is moving in - to catch the best views. Food is not served on the train but it is possible to buy snacks and refreshments during stops, especially on the longer routes. If you are travelling in Sardinia with kids this is a fantastic activity for the whole family.